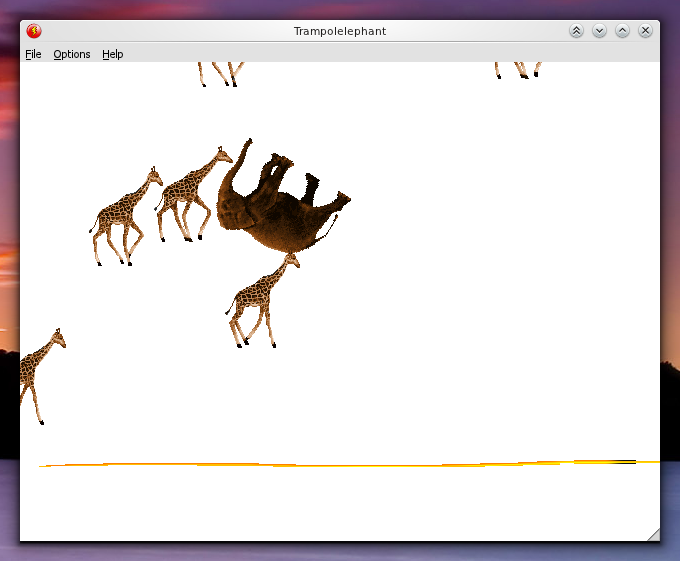 Trampolelephant is a game about elephants and trampolines that miraculously don't break when elephants and giraffes bounce on them. IMPORTANT: MOVE LEFT AND RIGHT USING THE LEFT AND RIGHT ARROW KEYS. I AM NOT RESPONSIBLE FOR ANY CONSEQUENCES THAT MAY ARISE FROM MOVING LEFT OR RIGHT. 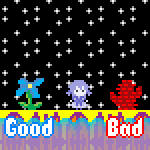 Made in the 30-minute afterjam with SpindleyQ (which I went over by about five minutes). I spent half the time making the title screen. I just realized that I misspelled the game's title on the title screen. uggghhh those hedgehog things are so creepy. is the elephant supposed to fall through if you don't move at all? i managed to get it at just the right angle so that it bounces forever, i think. The hedgehogs are from an example game that comes bundled with Klik & Play called Hungry Hedgehogs. And yeah, if you sit there long enough, you'll bounce so high that you'll pass through the "trampoline" as there is no in-between collision checking. Edit: Huh, not so sure about that, actually. If you made this in 30 min, an hour seems like plenty of time to make something awesome.